The Theophano Imperial Palace features Double Deluxe, Suite Deluxe (some with private pool), and Suite Club rooms with sharing pool. All rooms have a king size bed and vibrant, warm interiors and wall to wall carpeting, bathroom with Jacuzzi-bath, selection of hair and body lotions, bathrobes, slippers, hairdryer, shower kit, DSL Internet connection, LCD Satellite TV, personal in-room safe, mini bar and afternoon maid service. Extras for Delux Suites can include a separate master bed room with king size bed, Greek wine and fruits on arrival, flower bouquet upon arrival, 2nd bathroom with shower cabin, second bedroom with twin beds, coffee and tea making facilities, two flat screen TV’S and DVD (range of CD & DVDS), private butler service on request, early check in & check out up to 18.00 hours subject to availability, comfortable living area with dining table, choice of pillows, and a large terrace overlooking Toroneos gulf. 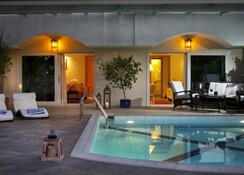 Some suites have their own private pool on the terrace. Offering 5 Star service and quality, the Theophano Imperial Palace is steps from the sandy beach in popular Kassandra, the most western Peninsular of Halkidiki and nearest to Thessaloniki. This superb hotel offers a full range of leisure facilities, fine dining, and excellent service for couples and families with deluxe accommodation decorated in warm and happy colours and such extras as Jacuzzi baths and quality accessories. Guests to the Theophano Imperial Palace can visit nearby historical sites, enjoy plenty of water sports, and roam the vast coastline featuring private bays. 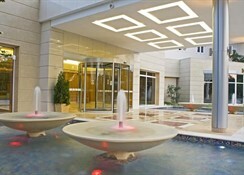 Thessaloniki International Airport is 14 km from the Hotel. Local Tips: Traditional Taverns, Discos, Bars and many other forms of entertainment can be found in Kassandra, including an extremely extensive variety of water sports. Food, drink and entertainment: Half Board accommodation. 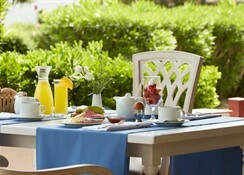 The hotel has a main restaurant for all day dining, a gourmet restaurant, Italian Trattoria, Mediterranean Tavern, two cocktail bars, pool bar, Piano Bar, Lobby Bar, full beach service, and 24 hour room service. 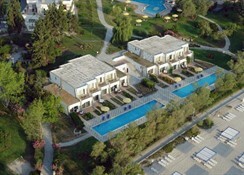 Sports, games and activities: Main swimming pool, children's pool, sun beds and umbrellas at pool and beach, beautiful green gardens, 6 tennis courts, beach volleyball court, tennis tables, mini golf, darts, beach and water aerobics, kid's club (4-12 years old) with special kids menus, and early suppers. Extensive water sports facilities are on the beautiful sandy beach, guests can rent sail boats, pedalos and canoes, jet skis, paragliding, banana boats and ringos. A professional diving centre provides the opportunity for all guests to try for a PADI Internationally acknowledged certificate. Additional: 24 hour reception, two large lobby areas, all suites with Sea or garden view, air conditioning, 24 hour room service, 24 hour security, shopping centre, laundry service, babysitting available at extra charge, International press, business centre, private parking.